The research engineers at DeepMind including well known AI researcher and author of the book Grokking Deep Learning, Andrew Trask have published an impressive paper on a neural network model that can learn simple to complex numerical functions with great extrapolation (generalisation) ability. 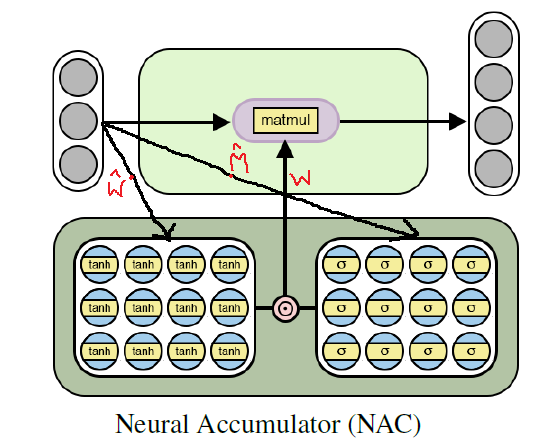 In this post I will explain NALU, its architecture, its components and significance over traditional neural networks. 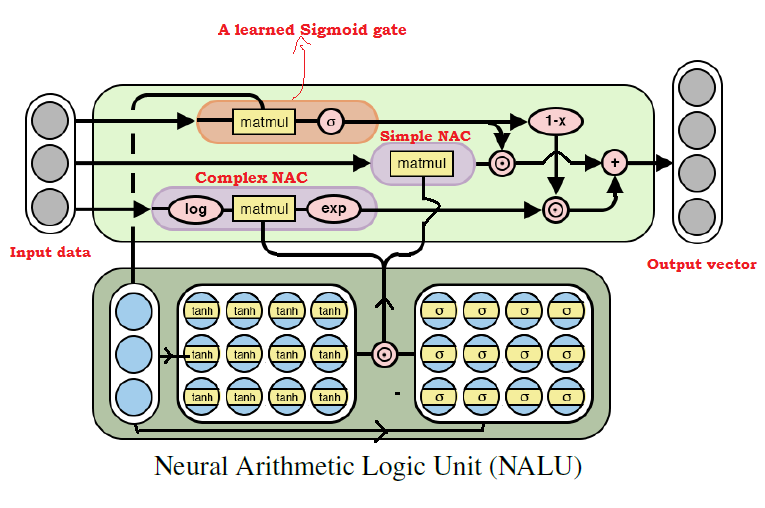 The primary intention behind this post is to provide simple and intuitive explanation of NALU (both with concepts and code) which can be comprehended by researchers, engineers and students who have a limited knowledge of neural networks and deep learning. Note: I strongly recommend readers to read the original paper for more detailed understanding of the subject. The paper can be downloaded from here. Where do Neural Networks fail? Neural networks, in theory, are very good function approximators. They can almost always learn any meaningful relationship between inputs (data or features) and outputs (labels or targets). Hence, they are being used in a wide variety of applications from object detection and classification to speech to text conversion to intelligent game-playing agents that can beat human world champion players. 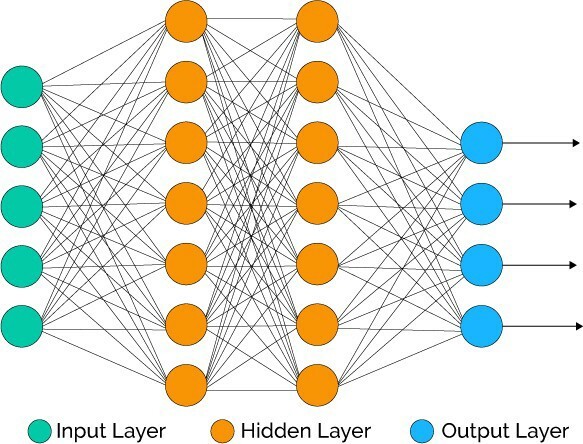 There are many effective neural network models which satisfied various need of such applications such as Convolutional Neural Networks (CNNs), Recurrent Neural Networks (RNNs), Autoencoders etc. Advances in deep learning and neural network models is another topic in itself. However, according to the authors of the paper, they lack very basic ability which seems trivial for a human or for even bees! That is the ability to count/manipulate numbers and also, to extrapolate the numerical relationship from an observable numeric pattern. In the paper, it is shown that the standard neural networks even struggles to learn even an identity function ( a function whose input and output is identical; f(x) = x) which is the most straightforward numeric relationship. Below image shows the mean square error (MSE) of various NNs trained to learn such an identity function. The primary reason for NNs to fail to learn such numerical representation is the use of non linear activation functions in hidden layers of the network. Such activation functions are crucial to learn the abstract non linear relationship between inputs and labels but they fail miserably when it comes to learn the numerical representation outside the range of the numbers seen in the training data. Hence, such networks are very good to memorize the numerical pattern seen in the training set but fail to extrapolate this representation well. It is like memorizing an answer or a topic without understanding the underlying concept for the exam. Doing so, one can perform very well if the similar questions are asked in the exam, however, would fail in the case of twisted questions are asked designed to test the knowledge and not the memorization ability of a candidate. The severity of this failure directly corresponds to the degree of non-linearity within the chosen activation function. From the above image, it can be clearly seen that the hard-constrained non-linear functions such as Tanh and Sigmoid have very less ability to generalize well than the soft-constrained non-linear function such as PReLU and ELU. The neural accumulator (NAC) forms the base to the NALU model. NAC is a simple but effective neural network model (unit) which supports the ability to learn addition and subtraction — which is a desirable property to learn linear functions effectively. NAC is a special layer of linearity whose weight parameters have the restrictions of having the only values 1, 0 or -1. By constraining the weight values in such a manner prevents the layer from changing the scale of the input data and they remain consistent throughout the network no matter how many layers are stacked together. Hence, the output will be the linear combination of input vector which can easily represent addition and subtraction operations. Intuition: To understand this fact, let us consider the following examples of NN layers which performs the linear arithmetic operation on inputs. Illustration to explain that the Neural network layers with no bias and having weights value -1, 0 or 1 can learn linear extrapolation. As shown in above NN layers, network can learn to extrapolate simple arithmetic functions like addition and subtraction ( y= x1 + x2 and y = x1—x2) by restricting the weight parameters to -1, 0 and 1. Note: As shown in the network diagrams above, NAC contains no bias parameter (b) and no non-linearity applied to the output of hidden layer units. Using above equation to calculate the weight parameters in the network, guarantees that the value of such parameters will be in the range of [-1,1] with more inclined towards -1, 0 and 1. Also, this equation is a differentiable equation (whose derivatives can be computed with respect to weight parameters). Hence, it will be easier for NAC to learn W using gradient descent and back propagation. Below is the architectural diagram of a NAC unit. 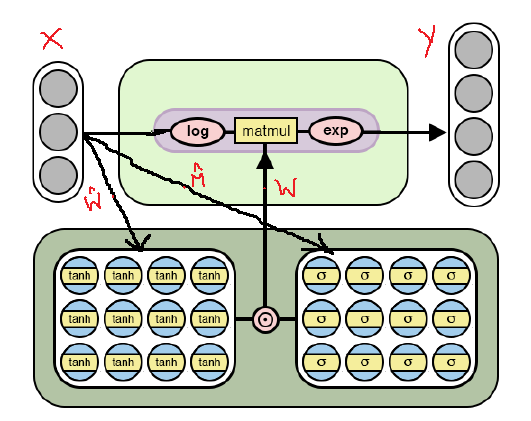 As one can imagine, NAC is a simple NN model with few little tweaks. Below I have shown the simple implementation of a single NAC layer in python using Tensorflow and Numpy library. In the above code, I used random uniform initialization for trainable parameters W_hat and M_hat but one can use any recommended weight initialization technique for these parameters. For full working code kindly checkout my GitHub repo mentioned at the end of this post. 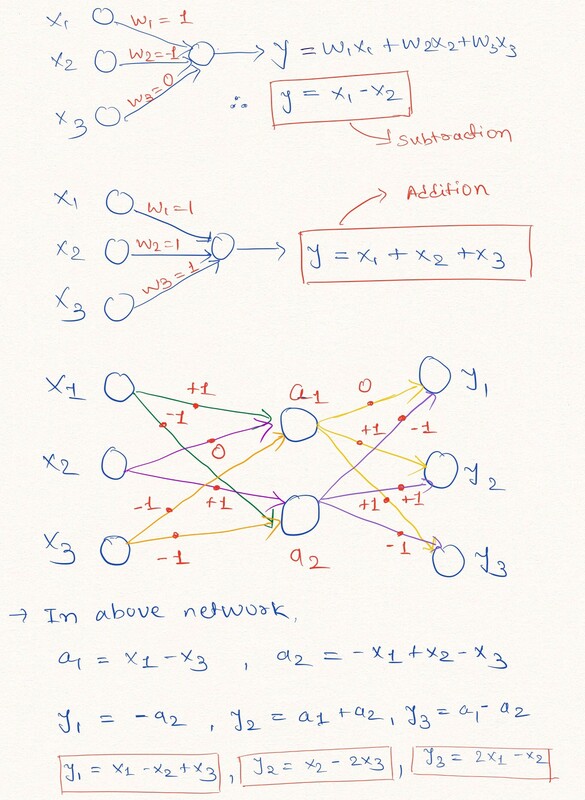 Though the above mentioned simple neural network model is able to learn basic arithmetic functions like the addition and subtraction, it is desirable to have the ability to learn more complex arithmetic operations such as multiplication, division and power functions. Below is the modified architecture of NAC that is able to learn more complex numeric functions using the log space (logarithmic values and exponents) for its weight parameters. Observe that how this NAC is different than the one mentioned first in the post. As shown in the diagram above, this cell applies the log function to the input data before matrix multiplication with weight matrix W and then it applies an exponential function on the resultant matrix. The formula to obtain output is given in the below equation. Hence, everything is same in terms of the underlying mechanism of simple NAC and complex NAC including the formula for restricted weights W in terms of W_hat and M_hat. The only difference is that complex NAC applies log space on input and output of the layer. As with the architectures of both NACs, the python implementation of complex NAC is almost same except mentioned change in the output tensor formula. Below is the code for such NAC. Once again, for full working code please checkout my GitHub repo mentioned at the end of this post. By now one can imagine that above two NAC models combined together can learn almost all arithmetic operations. That is the key idea behind NALU which comprises the weighted combination of a simple NAC and a complex NAC mentioned above, controlled by a learned gate signal. Thus, NAC forms the basic building block of NALUs. So, if you have understood the NAC properly, NALU is very easy to grasp. If you haven’t, please take your time and go through the both NAC explanations once again. Below image describes the architecture of NALU. As shown in the above image, in NALU both NACs (purple cells) are interpolated (combined) by a learned sigmoid gate control (orange cell) such that the output of either NAC can be activated or deactivated by gate based on the numeric function we are trying to train the network for. In the above formula of NALU, we can say that if gate output g=0 then the network will learn only complex functions but not the simple ones. In contrast, if g=1 then the network will learn only additive functions and not the complex ones. Hence, altogether NALU can learn any numeric functions consisting of multiplication, addition, subtraction, division, and power functions in such a way that extrapolates well to the numbers outside of the range of numbers that have been seen during training. In the implementation of NALU, we will use both simple and complex NAC defined in the previous code snippets. Again, in the above code, I used random normal initialization for gate parameters G but one can use any recommended weight initialization technique. Ibelieve NALU is a modern breakthrough in AI and specifically in neural networks that seems very promising. They can open doors to many applications which seem to be difficult for standard NNs to deal with. 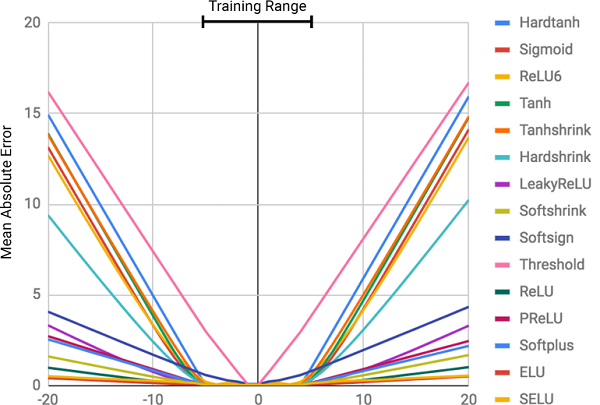 Authors have shown various experiments and results implementing NALU in different area of neural network applications in the paper from simple arithmetic function learning tasks to counting the number of handwritten digits in provided series of MNIST images to make the network learning to evaluate computer programs! The results are amazing and prove that the NALU excel to generalize well in almost all tasks involving numerical representation than the standard NN models. I recommend readers to have a look at these experiments and its results to gain the deeper understanding of how NALU can be useful in some interesting numerical tasks. However, it is unlikely that NAC or NALU will be the perfect solution for every task. Rather, they demonstrate a general design strategy for creating models that are intended for a target class of numerical functions. Below is the link to my GitHub repository that shows the full implementation of the code snippets shown in this post. You are welcome to try out various functions to test my model using different hyperprameters to tune the network. Let me know if you have any questions or thoughts on this post in the comments below and I will try my best to address them. PS: This is my first blog post on any topic. So, any recommendation, suggestions and future advises both, technical and non technical about my writing are welcome. Software Engineer | ML and DL practitioner | Master in advanced CS | A Tech lover and enthusiastic Traveller. Highly interested in ML and DL research.